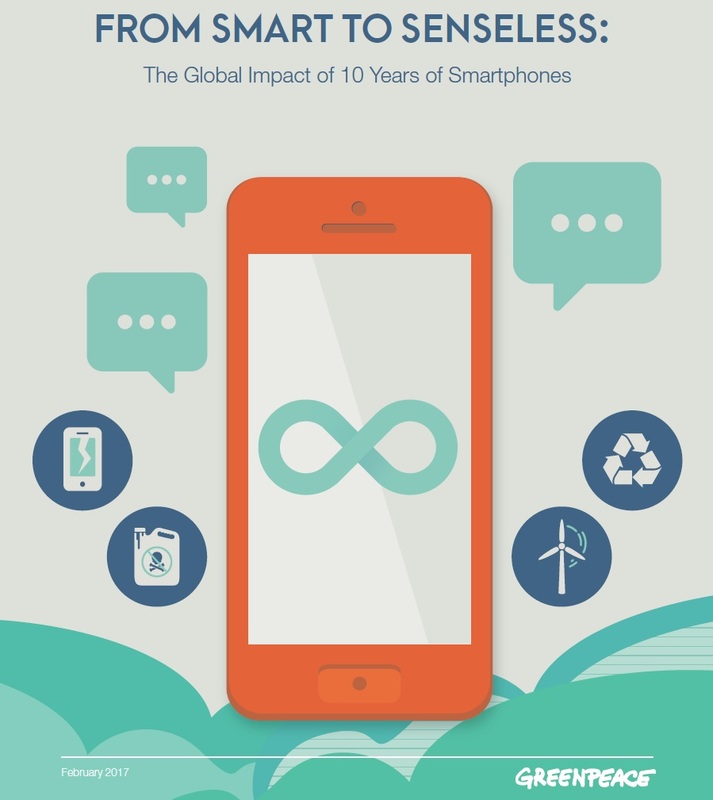 Smartphone production and disposal over the last 10 years is proving to have a significant impact on our planet, according to a Greenpeace USA report released today. The report shows roughly 968 TWh was used to manufacture smartphones since 2007 - nearly the equivalent of one year’s power supply for India - and the devices contribute significantly to the 50 million metric tonnes of e-waste expected to be generated in 2017. The report is released as Greenpeace Spain activists attempted to unfurl a banner from the building where Samsung was holding a press conference at the Mobile World Congress in Barcelona with the message “Reuse, Recycle, Rethink”. The activists are demanding Samsung reuse and recycle the 4.3 million Galaxy Note 7s recalled in 2016 following reports the devices were exploding or catching fire. “What has happened with Samsung’s recall of the Galaxy Note 7 is indicative of a wasteful and unsustainable system. Rushed design and production cycles can lead to wasteful mistakes, not to mention the impact on our planet,” said Jude Lee, Global Senior Campaigner at Greenpeace East Asia. 7.1 billion smartphones have been produced since 2007. In 2014 alone, e-waste from small IT products like smartphones was estimated to be 3 million metric tonnes, according to a United Nations University study. Less than 16% of global e-waste is believed to be recycled. Since 2007 roughly 968 TWh has been used to manufacture smartphones, which is nearly the same as one year’s power supply for India (973 TWh in 2014). Only 2 of 13 models Greenpeace USA and iFixit reviewed as part of the research had easily replaceable batteries. This means consumers are forced to replace the whole device when the battery life starts to dwindle. In the US, smartphones are used for an average of 26 months. Smartphone ownership is expected to rise to 6.1 billion phones in 2020, or roughly 70% of global population. “If all the smartphones produced in the last decade were still functional, there would be roughly enough for every person on the planet. Consumers are pushed to upgrade their models so frequently that the average device is used for just over 2 years. The impacts on the planet are devastating,” said Elizabeth Jardim, Senior Corporate Campaigner at Greenpeace USA. Greenpeace is calling on the whole IT sector to embrace a circular production model in order to address the root cause of many of these environmental challenges. Samsung should lead by example and publicly commit to recycle the Galaxy Note 7s while minimizing their impact on people and the environment. It must also be transparent about how it intends to deal with these phones.